The location of this photo was on the River Yare, on the eastern outskirts of Norwich in the UK. 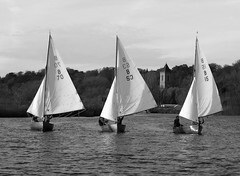 It was taken across the river from a club called the Norwich Frostbite Sailing Club. More details of what the boats actually are, when I manage to find out! What type of boats are they and where are they? I agree though: proper sailing, proper boats, proper course.